To provide improved function accuracy, consistent functionality that meets expectation, and function names that more accurately describe their functionality, several Excel functions have been updated, renamed, or added to the function library in Excel 2010. For backward compatibility, renamed functions remain available with their old name. For the following functions, algorithm changes have been implemented to improve function accuracy and performance. For example, because the BETADIST function was inaccurate, a new algorithm has been implemented to improve the accuracy of this function. The MOD function now uses new algorithms to achieve both accuracy and speed, and the RAND function now uses a new random number algorithm. The following Statistical functions (reference) have been renamed so that they are more consistent with the function definitions of the scientific community and with other function names in Excel. The new function names also more accurately describe their functionality. For example, because CRITBINOM returns the inverse of the binomial distribution, BINOM.INV is a more appropriate name. Some renamed functions, such as BETA.DIST, have an additional parameter so you can specify the type of distribution (left-tail cumulative or probability density). 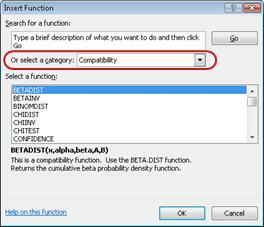 For backward compatibility with earlier versions of Excel, the functions are still available with their old name in the Compatibility functions (reference) category. However, if backward compatibility is not required, you should start using the renamed functions instead. The following functions have been added to the Excel function library. These functions can be used in the current version of Excel but are incompatible with earlier versions of Excel. If backward compatibility is required, you can run the Compatibility Checker so that you can make the necessary changes in your worksheet to avoid errors. Rounds a number the nearest integer or to the nearest multiple of significance. Regardless of the sign of the number, the number is rounded up. 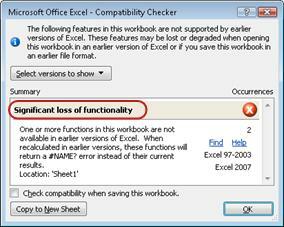 If you have to share your worksheet with other people who do not have Excel 2010 installed, you can use the compatibility functions instead of the renamed functions. Earlier versions of Excel recognize the old names and provide the expected results. On the Formulas tab, in the Function Library group, click Insert Function. In the Or select a category box, click Compatibility. When you start entering a function in the worksheet, Formula AutoComplete lists both renamed and compatibility functions. Distinguishing icons make it easier for you to click the one that you want to use. As mentioned earlier in this article, new functions are incompatible with earlier versions of Excel. Earlier versions of Excel cannot recognize the new functions, and #NAME? errors will be displayed instead of the expected results. Before you save your workbook to a file format of an earlier version of Excel, you can run the Compatibility Checker to determine whether new functions were used. This way, you can make the necessary changes to avoid errors. Click the Office Button, and then click Info. Under Prepare for Distribution, click Check for Issues, and then click Check Compatibility.